The Butler County Storm Water District is offering materials to help educate the general public about nonpoint source pollution, why it is a problem, and what specific actions people can take to help promote good water quality. These materials are excellent resources for the classroom or for placement at various locations around your community. Click on the images at left to view and download printable 11x17 PDF files to your computer. 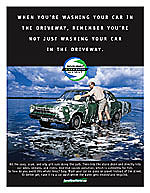 The education materials cover storm water runoff from cars, car washing, pet waste, and fertilizer/pesticide use. Each poster contains an overview of the specific situation that has been identified and tips for how to avoid it. 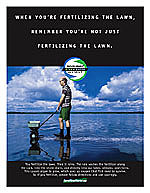 The award-winning posters/flyers were originally developed by the Puget Sound Action Team and the Water Quality Consortium in Washington state. They have been adapted for local use here in Butler County, Ohio. 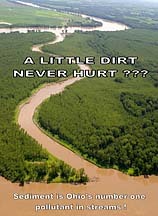 A Little Dirt Never Hurt??? This brochure explains the problem of loose sediment in stormwater runoff, why it matters, and what can be done to prevent it. A homeowner's guide to healthy habits for clean water offering tips for vehicle and garage, lawn and garden, home repair and improvement, pet care, septic systems, and swimming pools. This pamphlet provides a good overview for understanding stormwater runoff, its effects on the environment, and what citizens can do to help. 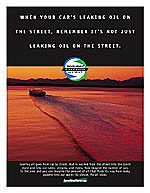 This poster/flyer depicts 10 easy things you can do to stop pollution of our creeks and rivers. This handout from the Butler Soil & Water Conservation District provides helpful tips for those who are purchasing a new home or property. 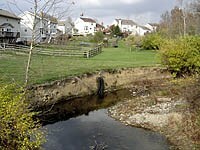 Have you thought about its natural features and drainage characteristics and what future impacts these might have? Be sure you read this before you buy. This tri-fold brochure outlines property owner responsibilities for proper storm water drainage improvements and maintenance and clarifies the limits of authority of public agencies. Ditch petitions are also explained. The Butler County Storm Water District, in cooperation with the butler Soil and water Conservation District, has additional resources available for teachers. Click here for more information. FREE WORKSHOPS The Butler Soil and Water Conservation District offers free programs and resources to any school or group located within Butler County. Full day workshops (6 hours or more) for the following programs are available: Project WET (Water Education for Teachers), Project WILD Aquatics, Healthy Water Healthy People, Wonder of Wetlands, stream walks, stream monitoring, and On the Trail of Non-Point Pollution Sources. We come to you! Most programs are 40 minutes in length and work well with one classroom (30 students max). Several separate classes can receive presentations on one day. These interactive presentations emphasize many curriculum areas. Scheduling is on a first come, first served basis. In-services can be arranged upon request. Topics can include materials from any of the previously mentioned workshops or other classroom program topics. These services are offered free of charge and discounted college credits can be obtained by attending the workshops. Furthermore, your school may obtain substantial credit (up to 30%) toward their annual storm water utility bill if you choose to implement any of the water based educational programs offered above. The number and types of programs offered may change over time. Please visit this web site frequently for updated information. If you or your colleagues are interested in taking advantage of these resources, please call 513-785-4101. 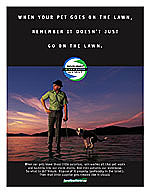 &COPY; Copyright BUTLER COUNTY STORM WATER DISTRICT. All rights reserved.